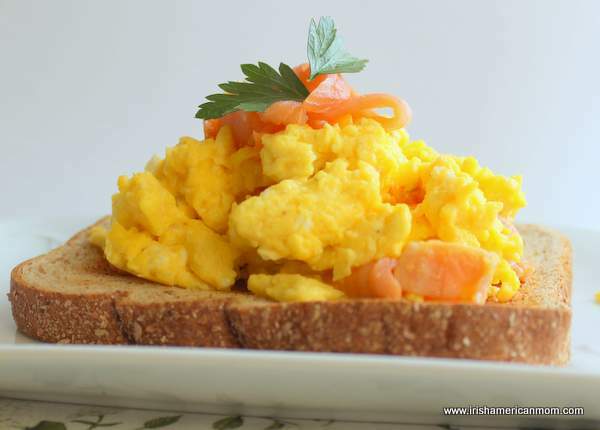 Scrambled eggs – a trusty breakfast staple in any Irish or American kitchen. Today we’re taking scrambled eggs to a whole new level of deliciousness by adding a little taste of the Atlantic or the Pacific. 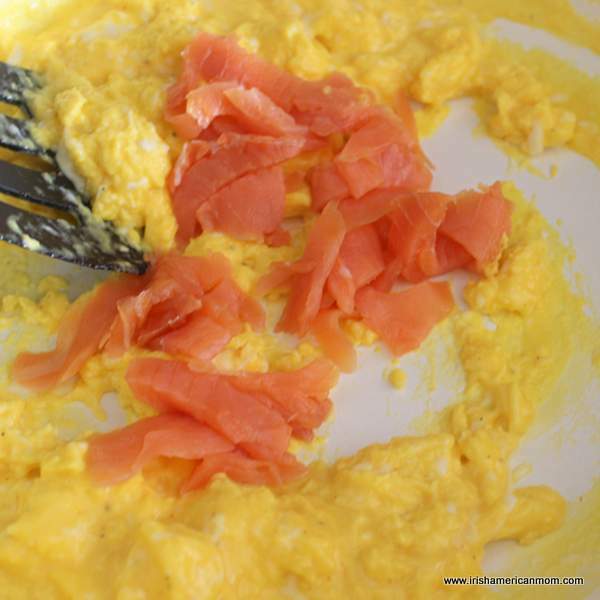 Smoked salmon and scrambled egg is a supreme breakfast combo in my Irish recipe book. 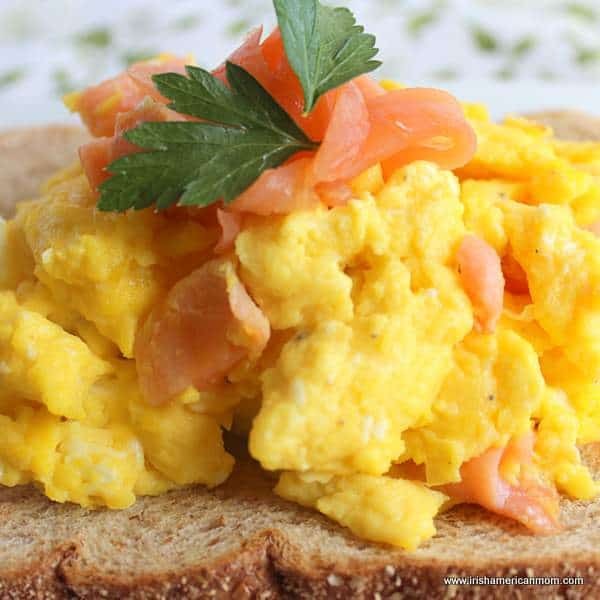 Slivers of smoked salmon perfectly compliment creamy scrambled eggs cooked in a pan of melted butter, and served on toast. 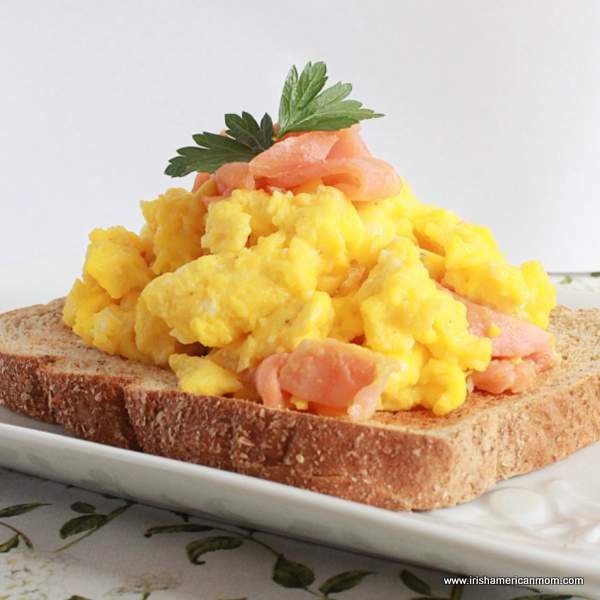 Smoked salmon scramble is an Irish and Scottish favorite for breakfast. The art of smoking salmon has been perfected in both countries. Long ago cooks discovered salmon and eggs are simply divine together, giving rise to this breakfast classic on toast. 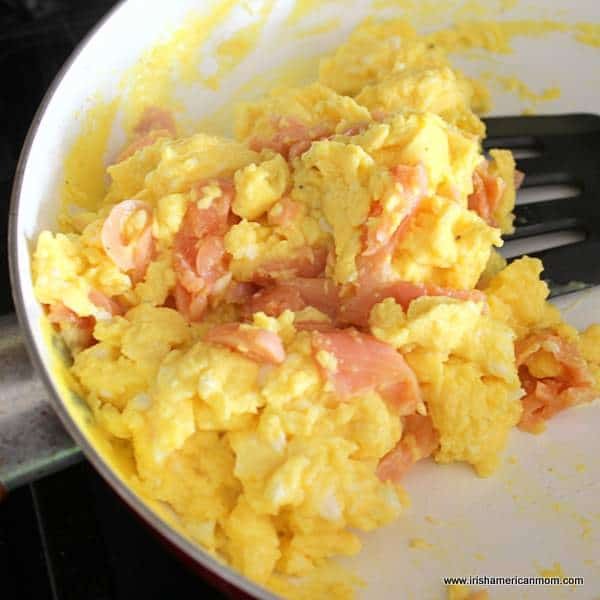 Here’s how I like to scramble my eggs with smoked salmon …. Before I get started melting butter in a skillet for my scrambled eggs, I like to prepare the smoked salmon. I do this by cutting the flat slices of salmon into slivers about 1/4 inch wide by 1 inch long. You can add all of the salmon to the scrambled egg, but I like to reserve a few slivers of this gorgeous orange hued fish to place on top of the finished egg dish. It really makes a lovely garnish. 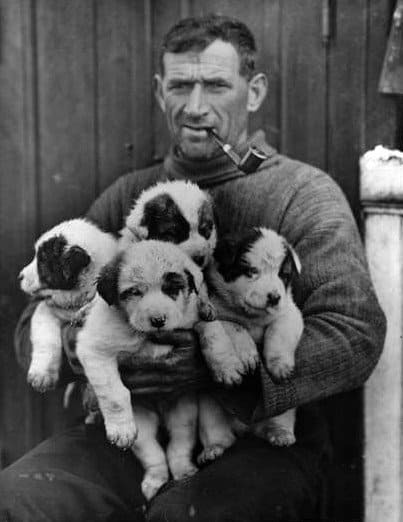 Next get those eggs ready for a scrambling. 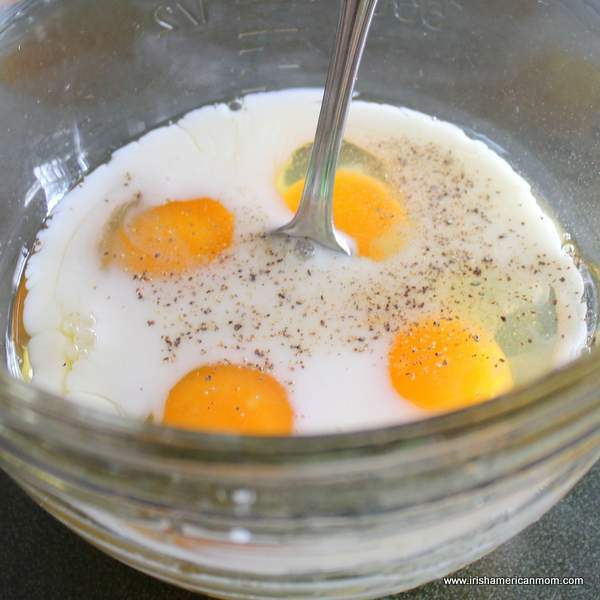 Crack all four eggs into a large bowl. Add the milk and season with salt and pepper. 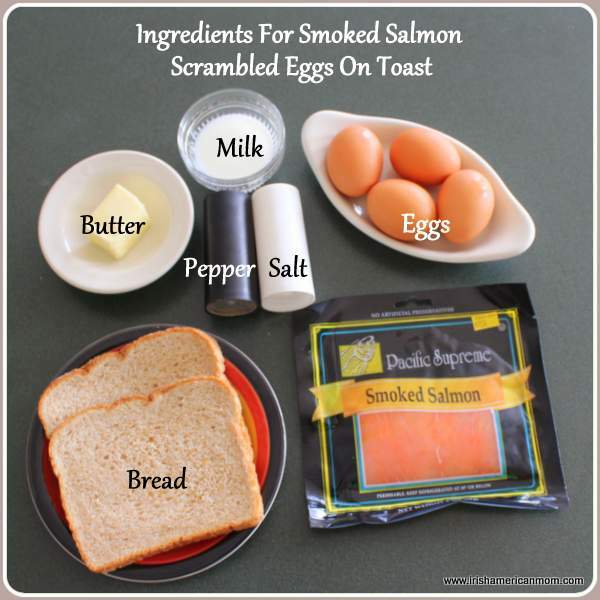 The smoked salmon adds saltiness to the eggs, so go easy enough on the salt. I’m one of those cooks who doesn’t like a lot of salt. 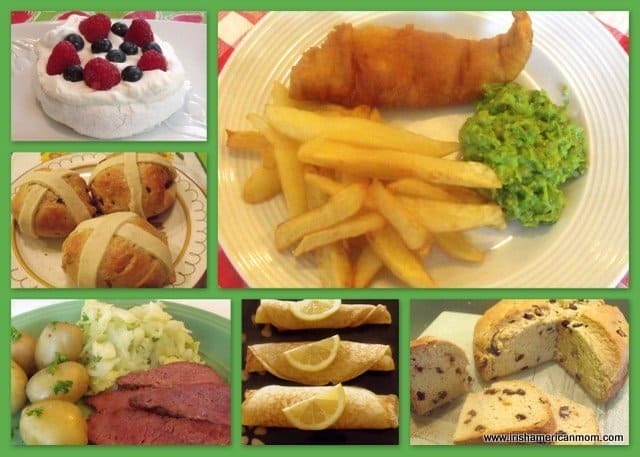 I’d never last long as a real chef – I’d be thrown out of any restaurant kitchen for lack of seasoning. Now back to the eggs. 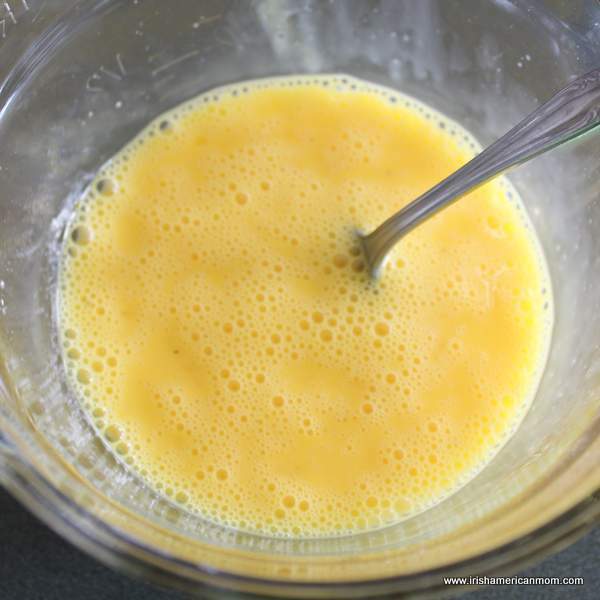 Whisk the milk and eggs together until small bubbles form on the surface. 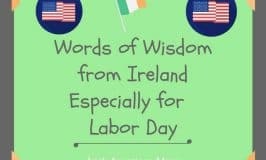 This is a tip from my mom. She always likes to incorporate a little air into eggs before scrambling. I don’t know if it makes any difference at all, but I whisk my eggs just the way my mother does. 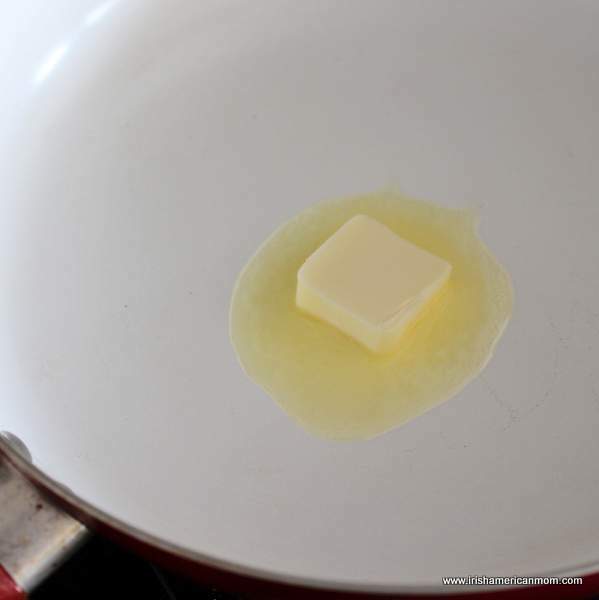 Melt the butter in a large skillet over medium heat until it begins to foam. 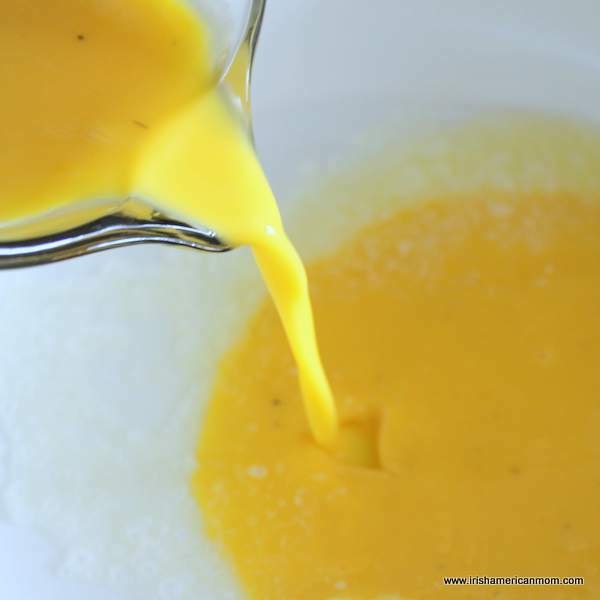 You can scramble your eggs in oil if you wish, but I find butter just gives a subtle creamy flavor to the finished scrambled eggs. Add the whisked eggs to the pan. Stir the eggs continuously with a pliable spatula, ensuring the eggs do not stick. Move that spatula around the pan in nice swirling motions making sure you lift the eggs along the edges of the skillet. Don’t let those eggs stick. As the egg begins to cook but is still slightly runny add the smoked salmon and stir through the egg mixture. Turn off the heat while the eggs are still a little runny. They’ll continue to cook as they sit in the pan. Pop the bread slices in the toaster. The eggs are awaiting. Butter each slice of toast and place on separate plates. Divide the scrambled egg mixture between the two slices of toast. Garnish with the reserved smoked salmon slivers. 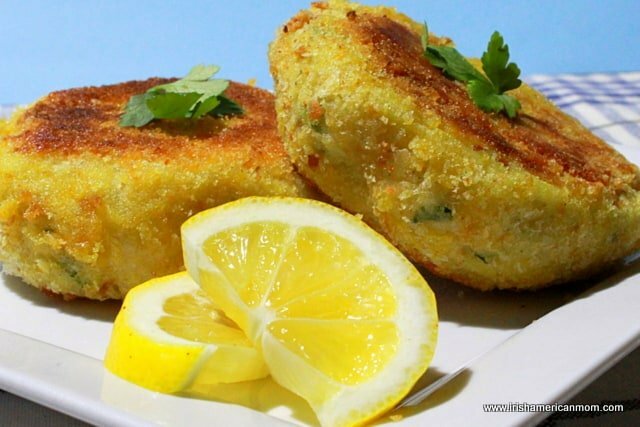 Add some parsley for extra color if you like, but rest assured I only added parsley for my photo shoot. I’ve usually gobbled this smoked salmon egg combo long before it ever sees any fancy parsley. And there you have it – a simple breakfast and a perfect way to treat mom or dad to breakfast in bed. My kiddos aren’t quite ready to scramble eggs unsupervised, but as soon as they can, they’ll know exactly what’s on mom’s breakfast wishlist. 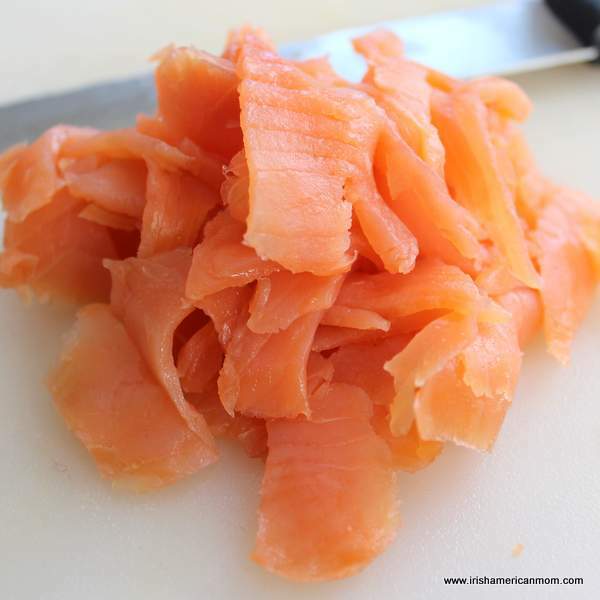 Prepare the salmon by cutting it into slivers about 1/4 inch wide by 1 inch long. Set 6 slivers aside for garnish. Crack the eggs into a large bowl. Add the milk and season with salt and pepper. Whisk together. Toast the bread, then butter each slice. Divide the scrambled egg mixture between the two slices of toast. Garnish with more smoked salmon. Happy breakfast scrambling to all! Mairead, this is indeed a breakfast that boosts the traditional morning’s scramble up several notches, a hearty morning repast guaranteed to appease Poseidon himself. One of the rites of spring in the PNW is the arrival of the first Copper River salmon from Alaska. Alaska Airlines delivers the season’s first catch. All the local t.v. stations jockey for position on the tarmac as the “salmon liner” rolls to a stop and the first prime Copper River salmon is deplaned into the ice chests of the highest bidder fishmongers and restaurateurs. Soon after, the pricey fish is advertised in the local grocery store fliers at King Midas prices; we commoners just blink, stumble on past, and settle for the farm-raised sockeye. Hi T.M. – Oh that wild salmon is pricey on both sides of the Atlantic. Smoked spam and scrambled eggs – I think it might be worth a try. It sounds pretty tasty to me. I remember working in a nursing home in Florida many moons ago, and one resident always mixed salsa through his scrambled eggs. He introduced this new taste sensation to the dining room. Before long there were many orders for salsa and scrambled eggs every single morning. Donkeys’ years before that I went on a high school trip to northern Europe. The principal of our school, who was a nun, drove 12 girls across England to Newcastle, then onto a ship, before touring around Norway, Sweden, Denmark and Holland for 3 weeks. Plenty of tins of spam were packed in the back of the minivan for quick, easy and inexpensive luncheons. Open air picnics on the top of a Norwegian mountain were simply delicious, eating spam sandwiched between fresh Norwegian bread – it had a crunchy crust like French bread, but the loaf was big and wide, and perfectly textured to compliment our spam filling. Now smoked Spam would have taken those sandwiches to another level of deliciousness altogether. 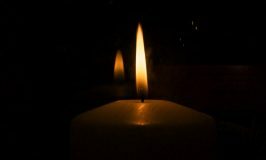 Thanks for kindling some happy memories. Single sliced spam – now that’s news to me, and good news too. No more opening a tin and having to slice off slabs of Spam. Yippee! This looks very healthy and delicious! A good start of the day! Hi Trees – If you like smoked salmon then this is the perfect way to start the day.